Newly developed system-Yakey Co., Ltd. The system plots the total electric load curve by instantly gathering data sent from PRO Pack in each demand area. The total electric load curve makes it possible to easily know company's total electric consumption and assume a key role for decreasing electric consumption. 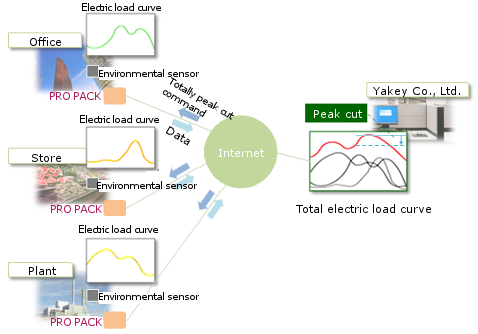 In even such as a demand area where the amount of electric consumption is low and the peak power does not exist, the target value of peak cut can easily be set up with the total electric load curve. Similarly, the peak cut is operated with the total electricity curve and it can be reduced better than the ordinary.